WFIRST was the No. 1 rated large-scale mission in the 2010 decadal survey for astrophysics. KISSIMMEE, Fla. — NASA's next flagship astronomy mission after the James Webb Space Telescope will become a formal project in February thanks to increased funding and direction from Congress, even as the agency looks to make cuts elsewhere in its astrophysics program. 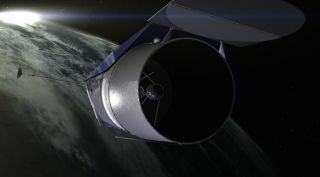 Paul Hertz, director of NASA's astrophysics division, told astronomers attending the 227th Meeting of the American Astronomical Society here Jan. 4 that the Wide Field Infrared Survey Telescope (WFIRST) will enter its "formulation phase," the beginning of NASA's project management process, in February after the proposed space telescope passed a mission concept review in December. The increase is not the first time Congress has added funding for WFIRST. In fiscal year 2015, NASA requested $14 million but Congress appropriated $50 million. In 2014, Congress provided $56 million for WFIRST. The intent of those increases was to accelerate a mission that astronomers identified as the highest priority large mission in their latest decadal survey, published in 2010. NASA had previously stated it did not expect to formally start the WFIRST project until fiscal year 2017, when spending on JWST was projected to decline as it neared its 2018 launch. "The Committee has accelerated this key mission recommended by the decadal survey and expects it to achieve overlap and scientific synergy with Hubble and the James Webb Space Telescope," the Senate report stated in June. NASA has been using the additional funding to perform technology development work, including for the mission's two key instruments: a wide field camera and a coronagraph that can be used to directly observe extrasolar planets. That work, Hertz said, has gone well. "We have made every one of our milestones on schedule so far," he said of that work. "We're making fabulous progress in keeping on that plan that will enable us to do WFIRST in the shortest possible period." One scientist involved in WFIRST endorsed that approach. "This is really a good way to do a big mission like this," said Neil Gehrels of NASA's Goddard Space Flight Center during a Jan. 5 conference session about the mission. "We can lower the risks and figure out the technologies before we get a large army developing the mission." The baseline plan for the mission calls for the use of one of the 2.4-meter mirrors provided to NASA by the National Reconnaissance Office in 2012. The spacecraft will operate at the Earth-sun L-2 Lagrange point for a prime mission of at least six years. NASA will not provide an official cost and schedule estimate for WFIRST until later in the project's development. In an October presentation to a National Academies committee, members of the WFIRST team estimated the mission's cost to be $2 billion to $2.3 billion based on the current baseline design. A notional schedule in that presentation showed the mission ready for launch in August 2024. NASA's astrophysics division overall received $730 million in the 2016 omnibus spending bill, $41.5 million above the administration's request when changes in accounting for education programs are included. However, the increase in WFIRST, as well as requirements in the bill to fully fund the Hubble Space Telescope and the Stratospheric Observatory for Infrared Astronomy, mean a shortfall of $36 million for other astrophysics programs. "We will be needing to make adjustments across the rest of the astrophysics portfolio to realize a savings of $36 million," Hertz said. Details about how those cuts will be implemented will be included in the agency's operating plan, which Hertz said should be completed in about a month.